Light-sheet fluorescence microscopy is an exciting new imaging method that harnesses thin sheets of light to make images of large biological samples such as fly and fish embryos, mice and even pieces of human tissue. And its use could lead to less intrusive and more effective diagnosis for patients. At the University of St Andrews, we have recently utilised the unusual properties of shaped laser beams to get a clearer image deeper inside specimens – using beams that bend and curve round corners and get brighter, rather than dimmer, as they travel. In contrast, if you hold a finger briefly in front of a conventional laser pointer you'll notice your finger glows as the beam scatters the light in all directions and only a small amount of light – if any – gets through. Microscopy has developed at a great pace since its development more than 350 years ago, yet it remains challenging to image large three-dimensional (3-D) samples. This means that biological samples tend to be single cell layers grown on a thin glass slide, which is not a very realistic scenario. People are 3-D beings and disease research needs to take that into account. If a person gets a drug for one illness, it would be nice if it didn't cause another one. It's for this reason that a lot of biomedical research is moving towards 3-D models to more accurately study diseases such as Alzheimer's and Parkinson's. However, light-sheet fluorescence microscopy is a technology particularly suited to imaging large volumes quickly and without causing any damage. The geometry for this form of microscopy was originally developed at the start of the 20th century to aid the study of nanoparticles. Richard Zsigmondy won the 1925 Nobel Prize in chemistry in part for developing this technology – but it later fell out of use. It was only with the advent of laser illumination and naturally occurring fluorescent biomarkers that light-sheet microscopy, in the past two decades, saw a renaissance in biomedical imaging. The lack of contrast in an image can prove a significant roadblock when it comes to imaging large samples. It's the equivalent of trying to read a book with transparent pages in the dark. If you shine a torch at the book the words on the page will be visible, but you'll also see the words in front of and behind the page you're reading – making it extremely difficult to tell which word came from which page. The same problem applies to trying to see inside large samples using fluorescence microscopy. When read the light-sheet way, the book becomes accessible again simply by holding the torch to the side of the book and shining it across each page separately. In light-sheet microscopy, a thin sheet of light is sent into the side of the sample which slices right across the part you want to look at. This way, fluorescence is still generated in the plane of interest but not anywhere else and the end result is a crisp, clear image. By making the light-sheet thinner, smaller objects become visable. This video shows a standard focused Gaussian laser beam (left) and special shaped beams which cheat divergence and don’t expand as they travel through focus – specifically a Bessel beam (centre) and an Airy beam (right). The real challenge is making a super-thin light-sheet which slices across an entire sample. Despite the innovative imaging approach, the light-sheet is still governed by the rules of optics. A standard laser beam – known as a Gaussian beam – is limited by divergence. If you focus a Gaussian beam down to a point, it will diverge and expand afterwards. If you focus it down more tightly, it will expand more rapidly. This limits the length of super-thin light-sheets, and so it can't be used for imaging large objects. Researchers began exploring the use of exotic beams with unusual properties for creating light-sheets in 2010. These beams cheat divergence and do not change their shape or size as they travel and so can remain thin over much greater distances than a standard Gaussian beam, giving a microscope with high resolution and a large imaging area. Bessel beams and Airy beams, which have been said to give a "triple-win" for microscopy, are the most notable of exotic beams to bend the rules. 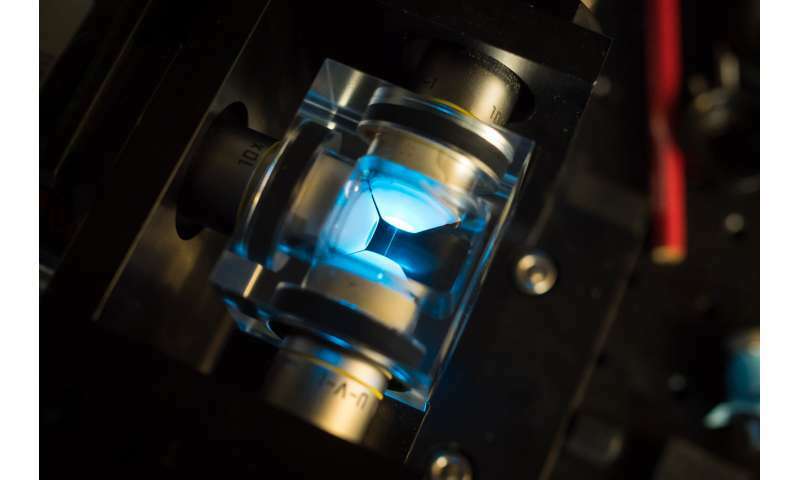 Not only do these exotic beams enable greater resolution over a large imaging area, but they also spread out their energy thereby protecting the sample from intense laser irradiation damage. They also resist scattering and so don't get distorted, resulting in high quality light-sheets and images. Recently, we've taken further control of the shape of these special beams, utilising beams and light-sheets that can grow in intensity and become brighter as they travel. 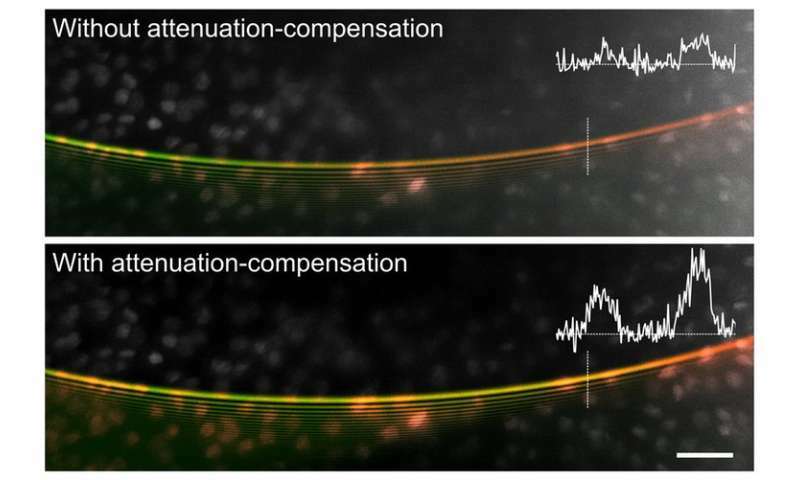 Using light-sheets that become brighter means that we get more signal from deep inside specimens where absorption would normally cause the light-sheet and image to become noisy and much fainter. The technique relies on controlling the way energy is spread out within the sample. The naive way to get more signal from deeper areas of a sample would be to turn up the laser power which could cause a lot of damage to the surface of the specimen. By selectively concentrating more energy in the deep layers only, we can increase signal in a way that shouldn't harm the specimen. Our research has shown this shaped light approach to be beneficial for light-sheet imaging, but we also expect it could push the limits of a range of other optical imaging techniques such as optical coherence tomography – a sort of "optical ultrasound" imaging method that's finding lots of clinical applications including retinal imaging. It's an exciting time to be working with such exotic beams.